Wow. This is a very thought-provoking book about the various aspects of finding your passion in the world. From paying attention to the voice in our heads, to having the courage to act upon that voice, and the journey that it often takes to get there. Gregg is a bright guy that has so much to say about this topic and how hard it was for him to find his passion that ultimately led to his life writing this book, doing passion retreats, and speaking around the world. As I try to summarize this book I am skimming the 100’s of sentences and paragraphs that I have highlighted looking for nuggets to share here. If you have read my blogs you’ll see how serendipity and trusting hunches is important to me and in Callings, he devotes a chapter to synchronicity, another way to create luck in your search for your new career path. Synchronicity is a coincidence…a meaningful coincidence that can inform us, primarily through intuition. A few times Gregg was on one of his journey’s looking for a change in work (to find that passion), he would find a Queen of Hearts playing card. One of his friends said it was telling him he was on the right path. I love those stories. 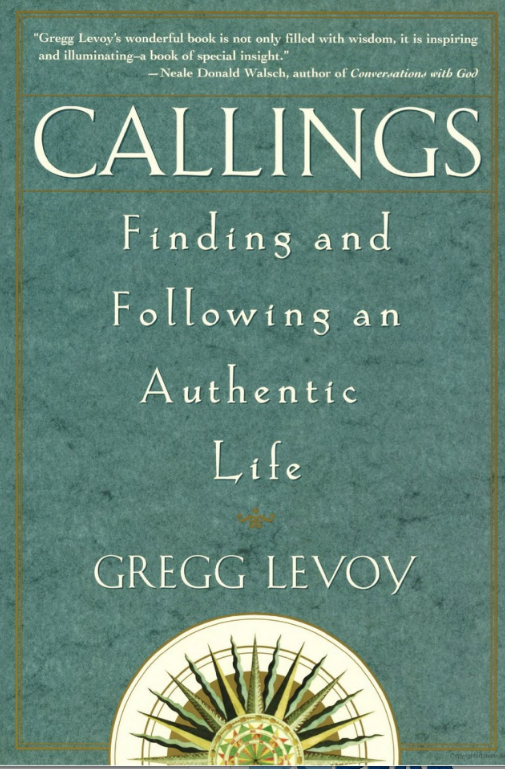 This book is a journey and one that I encourage you to take if you find yourself searching for something better. My book is filled with highlights and notes and my morning journal has even more thoughts from this book scattered throughout.